Wire necklace with a rubber tube and recycled glass bead. Penduka's glass beads are hand-made from recycled wine and beer bottles, cast by handicapped Penduka artists from the slums of Katutura district. 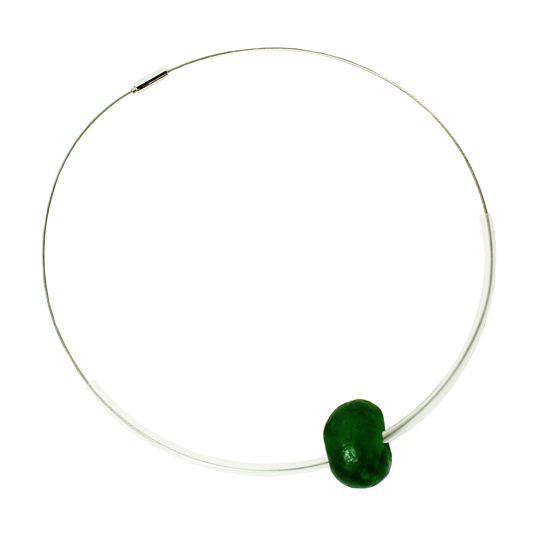 Beautiful wire necklace with a rubber tube and one large glass bead. Penduka's glass beads are hand-made from recycled wine and beer bottles, cast by handicapped Penduka artists from the slums of Katutura district, Windhoek. Unfortunately, Namibia does not have a glass return system in place yet. Waste glass can, therefore, be seen everywhere, cynically called 'desert flower' after thrown out of cars. Penduka has a glass recycling department in which 3 deaf women select, clean, pounder and melt glass, finally polishing it by rubbing it through the sand before making lovely jewelry of it. Every bead is formed by hand and unique. Through this process, we try to keep the area around Penduka cleaner, create a product you enjoy, and get an income for Olivia, Rebecca, and Maria.